J. Paul Getty Museum, 9781606060650, 176pp. Although monkeys had been used to mimic man and his foibles in the margins of medieval illuminated manuscripts, a taste for depictions of elegant monkeys developed among the French aristocracy at the end of the seventeenth century. 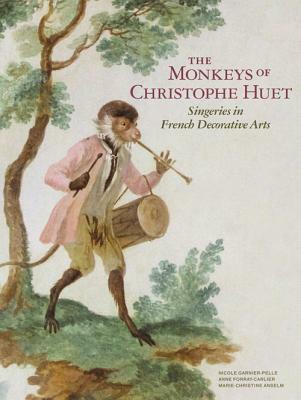 This delightful book traces the evolution of the monkey motif into a distinct genre known as singerie (from the French word “singe” meaning monkey) during the exuberant Rococo period. The designer and engraver Jean Bérain (1640–1711) was the first to insert monkeys into scenes of Renaissance grotesque decoration, surrounding them with scrolling foliage, fantastical creatures, and Chinese motifs. Claude Audran III (1658–1734) developed this style further with his satirical wall painting of monkeys at Louis XIV’s Château de Marly. But it was Christophe Huet (1700–1759), an acclaimed painter of animals, who produced the best-known surviving examples of singeries for the Château de Chantilly north of Paris. Huet’s life and work is the focus of this book. In his whimsical paintings monkeys, acting as surrogates for the chateau’s aristocratic occupants and guests, are shown singing and dancing, bathing, hunting boar, and sledding on the frozen lake. Huet’s work is placed in context through an examination of lesser-known interiors with singeries decoration as well as monkey motifs in the decorative arts ranging from tapestries and teapots to furniture mounts and fireplace accessories. Nicole Garnier-Pelle is curator in charge of cultural heritage at the Conde Museum in Chantilly, France. Anne Forray-Carlier is chief curator at the Museum of Decorative Arts in Paris. Marie Christine Anselm is an art historian specializing in harpsichords and their decoration."